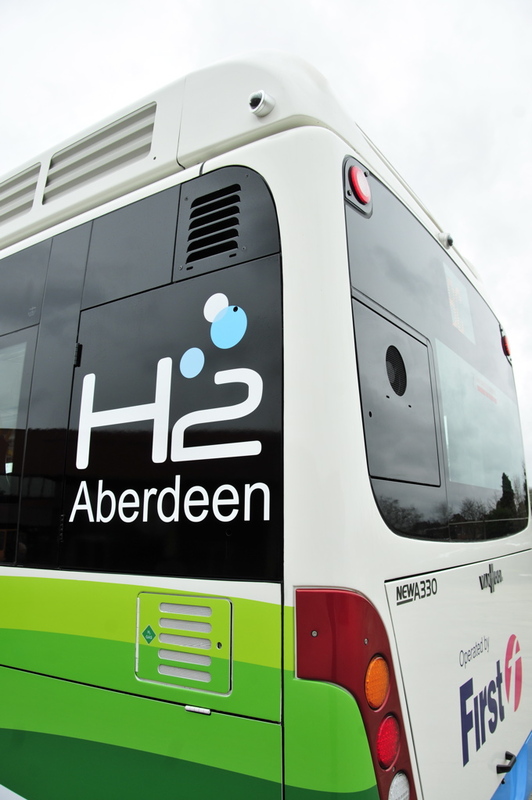 H2 Aberdeen is an initiative working to bring about a hydrogen economy in the Aberdeen City Region. It aims to reinforce the area’s position as an energy city, now and in the future. With the transferable oil and gas expertise in the North East of Scotland, as well as a capacity for renewable energy generation, there is an opportunity to further enhance economic competitiveness by being at the forefront of a hydrogen economy. H2 Aberdeen aims to stimulate innovative hydrogen projects, advance the take-up of hydrogen technologies and position Aberdeen as a centre for excellence for hydrogen technology. a hydrogen strategy outlining the key actions required by the City Region over the next 10 years. a state-of-the-art hydrogen production and bus refuelling station. 10 hydrogen fuel cell buses, the Europe’s largest fleet. the Hydrogen Transport Economy (HyTrEc) (Hydrogen Transport Economy for the North Sea Region) which includes the trial of fleet vehicles – hydrogen hybrid vans and plug in range extended vans. continue to further develop the supply chain in Aberdeen and Scotland. The team at AREG is committed to ensuring that businesses in Aberdeen City and Shire capitalise on opportunities in renewable energy and that our members achieve success in this rapidly growing market. Please contact us with your news, views, concerns and successes so that we are well placed to deliver on your behalf. AREG has played an important role in the growth of Scotland’s renewable energy sector, engaging the supply chain and developing the European Offshore Wind Deployment Centre. However, we are only at the very beginning of the transition that AREG was established to both lead and support so there are still opportunities for companies to get into the constantly evolving renewables supply chain. “We look forward to continuing our work together as renewables builds on its place as Scotland’s main source of power, and as we seek to deliver real change in the crucial areas of heat and transport. Aberdeen & Grampian Chamber of Commerce has worked closely with AREG since its formation. The recent progress in the developments of offshore wind projects by Equinor and Vattenfall are as a result of the work of the group over many years. The north-east is known as the oil and gas capital of Europe. At the Chamber, we believe the region must evolve its position to being recognised as the energy capital. Whilst hydrocarbons will continue to be essential in driving our economy for years to come, the generation of renewable resources will play an increasingly important role in providing cost-effective power, innovative development and economic growth. The enthusiasm and dedication of the early group that would become AREG was fundamental in us choosing to launch All-Energy in Aberdeen. The first tiny show was held in 2001, and AREG’s Chairman at the time, Jeremy Cresswell, played such an active role that I often describe him in terms such as All-Energy’s ‘midwife’. All-Energy is now the UK’s largest renewable and low carbon energy exhibition and conference in terms of number of attendees, space booked, and number of exhibiting companies. As AREG became firmly established, their presence and support for the event grew spectacularly over the years. We thank them most sincerely for their invaluable input. Vattenfall has forged a strong working relationship with AREG through the development of the European Offshore Wind Deployment Centre. AREG has worked tirelessly on behalf of the North East and it can take enormous credit for the growth of sustainable energy in the region and the path it has cleared for the region to capture further investment. Aberdeen City and Shire is emerging as a key location for renewables by successfully transferring its world-class oil and gas expertise into the sector and AREG has done much to advance this through a broad range of initiatives. It has acted as a catalyst in driving further investment in the local economy by engaging with companies, Government, public bodies and existing projects and we have been pleased to support their efforts. Scottish Enterprise will continue to engage with AREG as we increase Scotland’s use of renewable energy. AREG wants Aberdeen to be as famous for renewables as it is for oil and gas, renowned for the successful transfer of technology, skills and engineering expertise; its entrepreneurial approach and can-do attitude. AREG has a number of exciting opportunities for companies to sponsor its Lunch n Learn series and its Members Events series – the ideal platform to raise your profile in front of your target audience and key individuals. Contact events@bigpartnership.co.uk or 01224 211045 for more information. Sign up below to receive the latest AREG news. Your email will solely be used by AREG to contact you with news and updates. Registered in Scotland no. SC261364. Registered Office: Johnstone House 52-54 Rose Street, Aberdeen AB10 1HA.